Live and Sleep has designed a Luxury mattress that is supposed to blend the perfect balance of comfort and support. 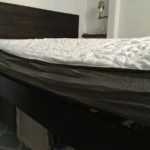 They sent me their latest mattress (free, but my opinions are my own) so I could help my readers see how it sleeps. 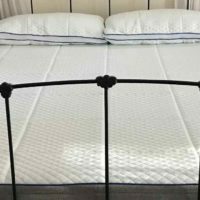 Let’s check out how well it does in my Live and Sleep Luxury Mattress Review below. 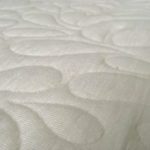 I give the Live and Sleep Luxury mattress a 7 or 8 out of 10 firmness (10 being the firmest). The mattress was a little bit deceptive as I tried to gauge the firmness. On first feel, the Luxury bed is quite firm. As you lay a few moments longer, the top 2.5 inches of foam soften and hug your body. It gives somewhat, but I didn’t sink too far into the bed. 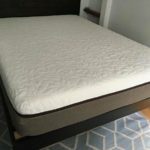 As a back sleeper, I really enjoyed this comfort/firmness level and woke up feeling rested and my back very comfortable. My partner, however, is a side sleeper and had some trouble sleeping on this bed. She prefers much softer beds and was not able to get comfortable on the Live and Sleep, as the firmness caused her back to twist too much. She solved it by putting a pillow under her leg but said it doesn’t seem ideal for side sleepers. As a back sleeper, I found the Live and Sleep offered phenomenal support. I didn’t expect anything less knowing that I was sleeping on top of 8.5 inches of high density support foam. As a back sleeper I woke up rested and energetic after each night. The Luxury sleep mattress had an average response. In the video above you can see that when my partner sits on the edge of the bed, the mattress takes a second to reform after she stands up. This is typical of a full foam mattress. It’s great for sleeping, but one thing to note is that for “nighttime activities” it can tend to be a bit more tiresome, as you are sinking in one direction each time you move. The Luxury Live and Sleep Mattress had no temperature issues. We turned the heat up and down in the room but the bed never overheated. Live and Sleep includes a 1 inch gel layer to help pull heat away from the sleeper. I found zero smell when I first opened this bed, which is particular impressive as a lot of these boxed mattresses have a chemical smell for at least a few hours after opening. 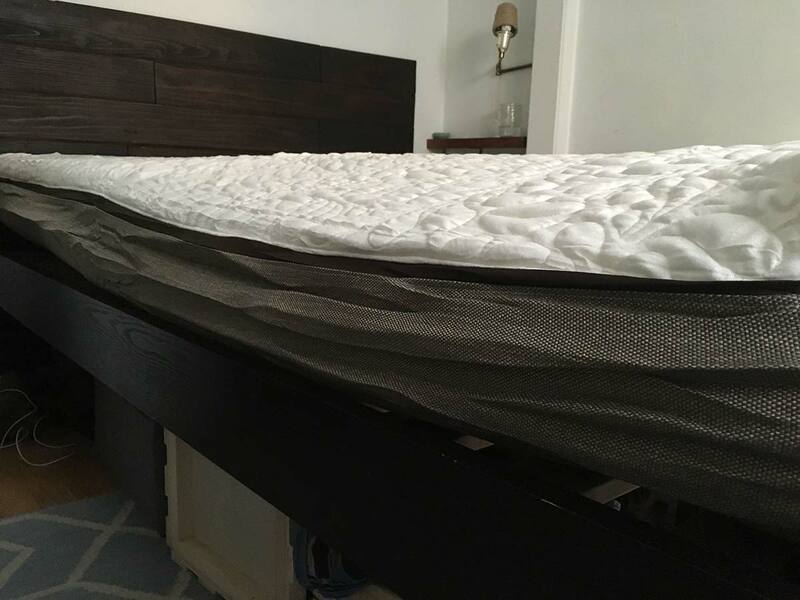 The Live and Sleep Mattress uses only CertiPUR-US materials. 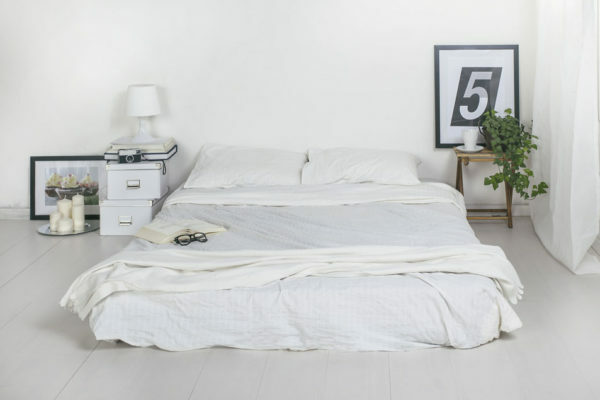 This bed won’t stink up your room. 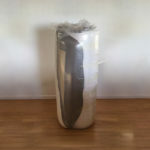 Mattress is very thin when you first remove it from wrapping. Over a few hours it grows to almost 2-3 times its height. Close up of fabric cover. This is only an issue for when you first open and move the mattress—it’s really heavy. 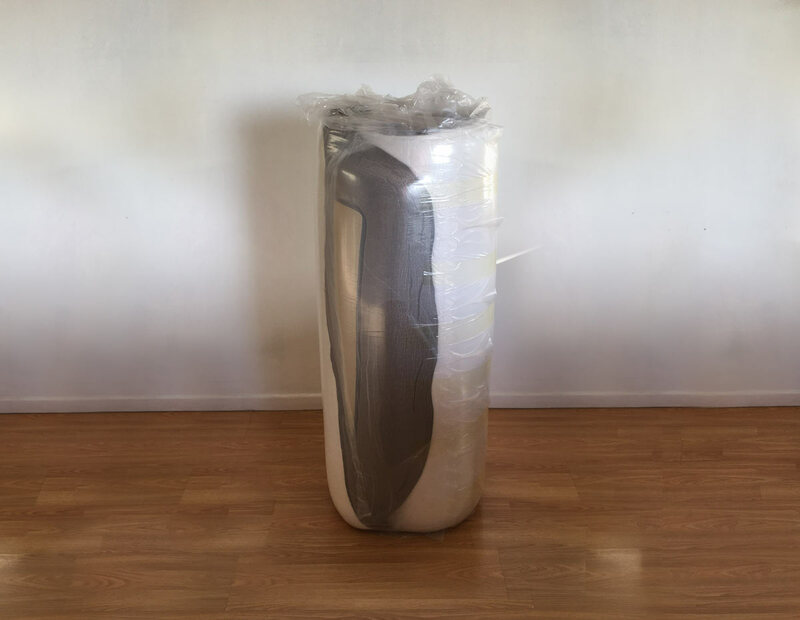 I recommend having someone help you carry this mattress, as well as open it up and move it into place. You don’t get 12 inches of comfortable foam without those few extra pounds. 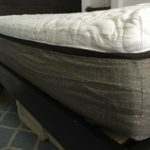 The Live and Sleep also took the longest of any mattress to expand into its final shape after we removed it from the box. I’d say you want to leave it for at least 8 hours—if you open it up right before bed you probably won’t experience the mattresses’ full potential the first night. 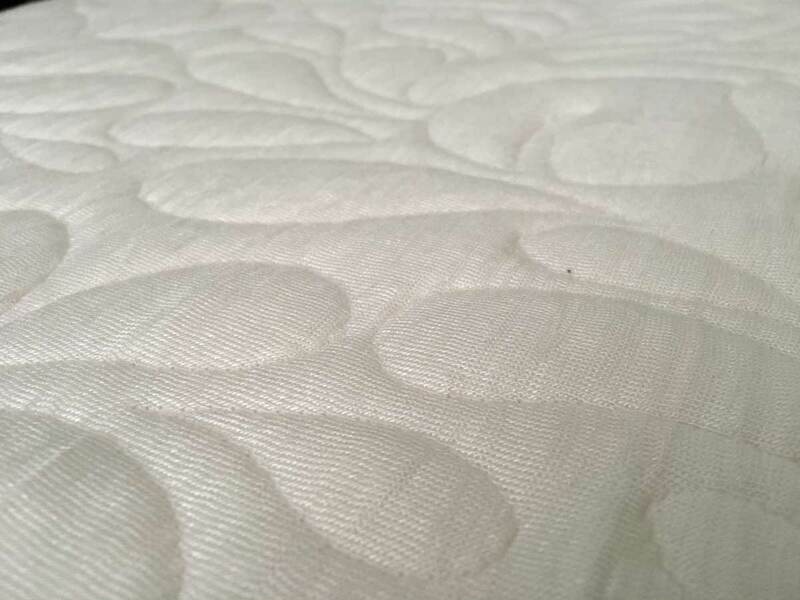 For back sleepers, the Luxury mattress has great support and leaves you rested in the morning. Let’s take a look inside the bed’s layers. This bed is well made and heavy! Soft cotton like cover that is stretchy and very breathable. 2.5″ of memory foam give the firm initial feel that slowly softens a bit. 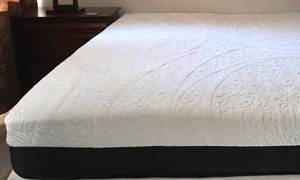 1″ of Gel infused memory foam designed to remove heat. 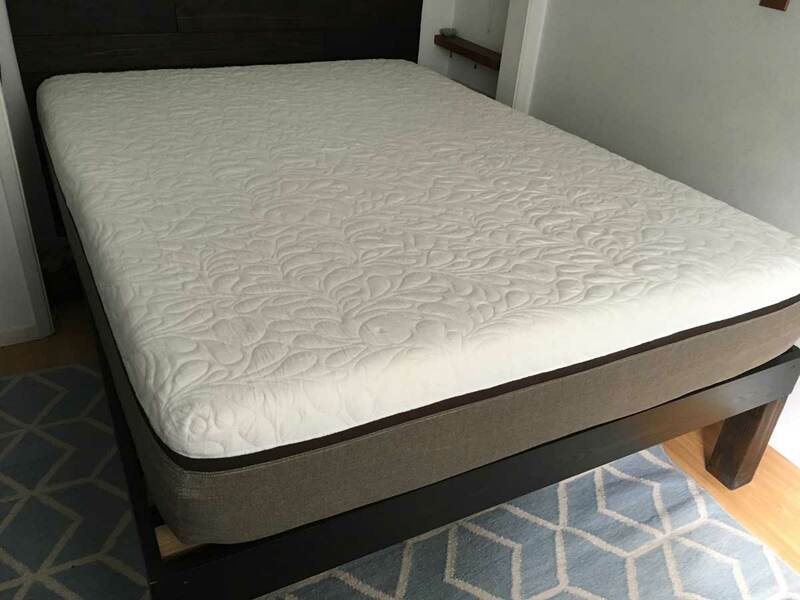 8.5″ of high density support foam make up the foundation of the Luxury mattress. This is what provides a comfortable sleep through the entire night for back sleepers. 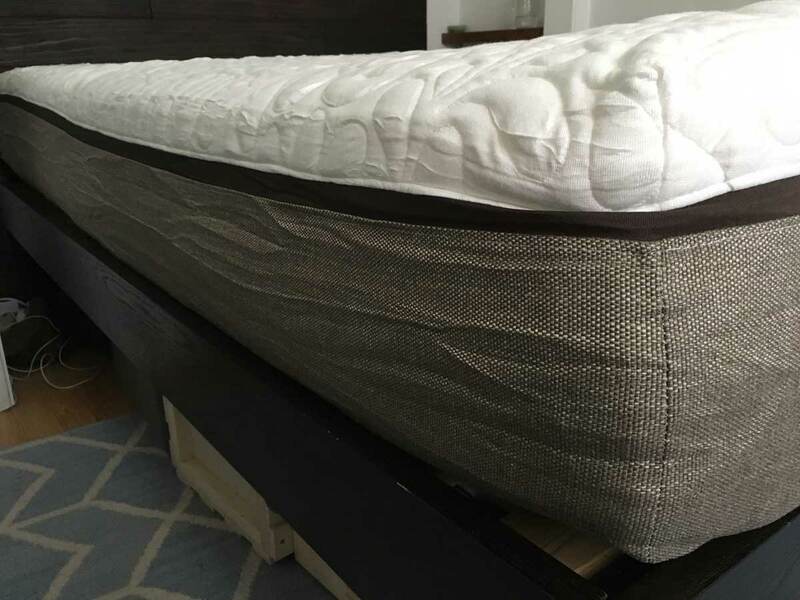 The Live and Sleep Luxury mattress is a dream mattress for back sleepers. Coming in at a 7/10 firmness level, the bed cradles your body without a lot of sinkage. However, side or stomach sleepers looking for a cloud-like bed would do better looking elsewhere (here are our recommendations). 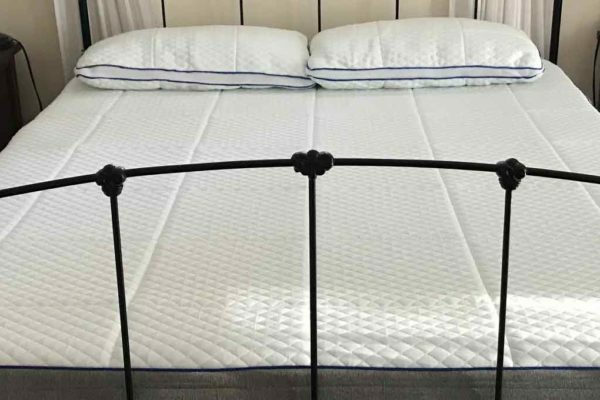 The Luxury mattress is not the most responsive bed I have tried, but it does a good job for a full foam mattress. Want to try it out for yourself? 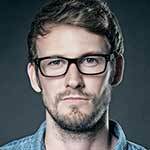 Live and Sleep has a 100 night risk free trial. Buy the mattress now, get $100 off and see if it is right for you. Have any extra questions? Ask them in the comments section below.